If the arrest of Kumar in 2009 – accused of leaking information gained while working for McKinsey clients – cut deep, the reports of Gupta’s alleged connection to insider trading, which started to circulate the following spring, risked infecting the whole partnership. “This was the guy who was representing the values globally,” says one corporate strategy head who was working for McKinsey as an associate at the time, adding that the sense of disappointment and betrayal was strongest among junior staff. 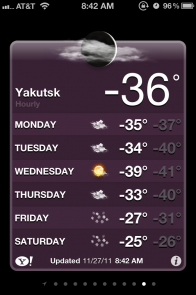 Yakutsk, the coldest city on the planet, has always been a source of curiosity for me. Located in depths of Siberia, it has pleasant summer temperatures maxing out in the twenties Celsius, but in winter it plunges to an unfathomable negative 50 degrees. If you’ve ever walked into a commercial freezer for 30 seconds, you’ll know roughly what it’s like. But to live there? It seems absurd. 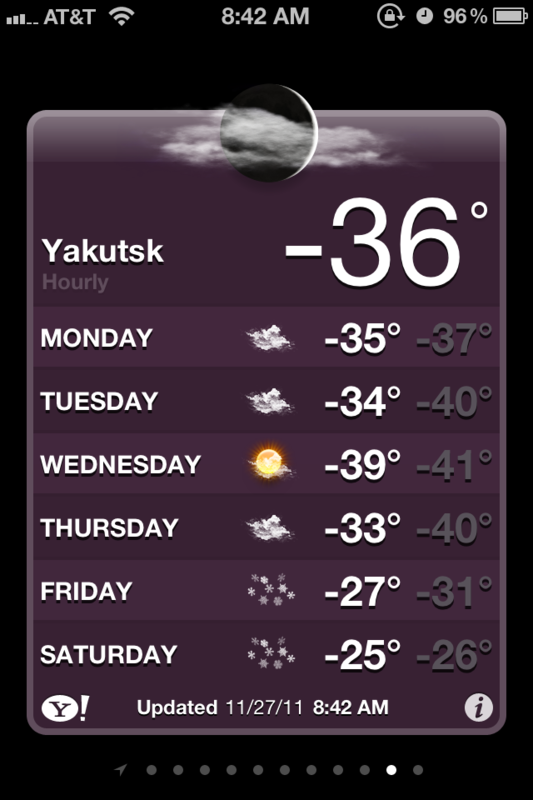 I actually have Yakutsk’s weather on my iPhone weather app just to make me feel warm. I know this because Ive just arrived in Yakutsk, a place where friendly locals warn you against wearing spectacles outdoors. Yakutsk is a remote city in Eastern Siberia population 200,000 famous for two things: appearing in the classic board game Risk, and the fact that it can, convincingly, claim to be the coldest city on earth. In January, the most freezing month, average “highs” are around minus 40C; today the temperature is hovering around minus 43C, leaving the city engulfed in an oppressive blanket of freezing fog that restricts visibility to 10 metres. Fur-clad locals scurry through a central square adorned with an icy Christmas tree left over from the New Year holidays and a statue of a strident Lenin, with one arm aloft and pointing forward, thoroughly unfazed by the cold. A couple of weeks ago, Yakutsk hit the headlines after a series of burst pipes caused Artyk and Markha, two nearby villages, to lose their heating for several days. The temperatures then were minus 50C. Television footage of the ensuing “big freeze” showed groups of people huddled in swathes of blankets gathering round makeshift wood-fired stoves to keep warm. It looked like fun – of a sort. So I decided to come to Yakutsk for myself to find out how people manage to survive, and go about something resembling daily life, in the worlds coldest place. General Electric, one of the largest corporations in America, filed a whopping 57,000-page federal tax return earlier this year but didnt pay taxes on $14 billion in profits. The return, which was filed electronically, would have been 19 feet high if printed out and stacked. Would you invest in United States, Inc.? 10 year treasuries are at 2% and 30 year treasuries are only 3.125% (well past the date that entitlement spending is projected to exceed GDP). Globe and Mail published an excerpt from a newish book written by an ex-Lehman trader called Street Freak. I just placed an order for it on Amazon. It all made sense now. These drunks who went and bought Archstone, the drunks who had risked the entire firm, were getting paid assloads of money. The traders thought that the bankers were getting rich. The bankers thought that the traders were getting rich. They were both wrong: the people in real estate were getting incredibly rich. How much talent does it take to buy a building and wait for it to go up in price? Italy’s bonds have taken centre stage on financial markets. What’s at stake is whether Italy enters the feedback loop that ensnared Portugal, Ireland, and Greece. Once bond yields went past 6.4% in all those countries, they reached a kind of tipping point where investors lost confidence that those governments could ever repay their debts. 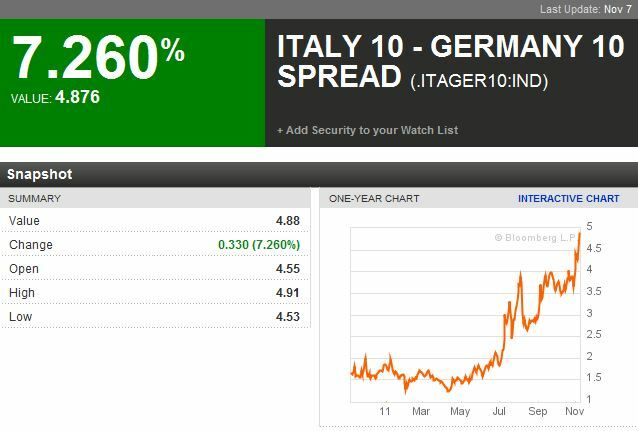 Ten-year Italian bond yields reached as high as 6.68% yesterday. 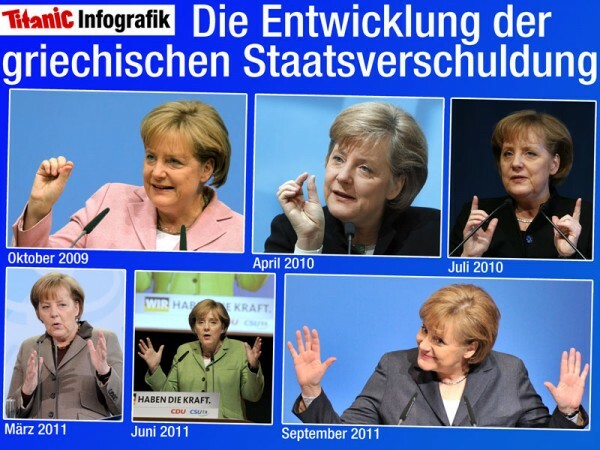 That was 491 basis points higher than equivalent German debt. It’s not far below 7%, either. According to the Wall Street Journal it took Portugal’s yields 45 days to go from 6.5% to 7%. Irish yields did it in 34 days. Greek bonds did it in a day. Bond traders call it “cliff risk“. A simple way to think about it is as a feedback loop, where rising bond yields lead to a collapse in confidence, which leads to more rising bond yields. The whole thing feeds on itself and accelerates. And in the government bond market, it appears to happen when 10-year yields go past 6.4%. There are a few reasons for this. The simplest reason is that the interest paid on new government debt gets prohibitively higher beyond 6.4%. Government bonds are supposed to be “safe” because the government can always raise taxes to pay off bond holders. But a yield of 6.4% or beyond indicates the opposite: government bonds are not safe and may not pay off at all. Over the last year, I have been having a long-running and sometimes heated (but civil) debate with a friend over whether it was a good decision for Groupon to turn down Google’s $6bn offer. To finally get away from “all talk, no action”, we made a bet with each other yesterday, just before Groupon priced. The bet was that the average market cap over the one month period (based on the average of each trading day’s closing price, as reported by Google Finance) after the date 6 months after Groupon listed (i.e. 6 months from today) would be greater than $6bn. We’re not finance guys, but this was roughly designed to factor in the 6-month lockup period and approximate a period in which many Groupon employees are likely to dump their stock on the market. I think Mason was right in turning down Google, so I took the over side of the bet, and he took the under. The wager is nothing too glamorous – just a dinner. Although the venue was left unspecified. Groupon priced at $20 last night – slightly above its $16-18 range. GRPN listed at $28 today, before falling to close at $26.11, giving it an implied market cap of about $16.6bn. To reach a value of $6bn, its stock price would have to decline to about $9.41. It’s a long way down from $26 to $9 (-65%), but it’s not unfathomable. Just look at Renren, which listed at $18 and, almost exactly 6 months later, is now just a little above $5. The Greeks want to hold a national referendum (next January) before agreeing to their bailout package. This did not go down well with the rest of Europe. In Athens, Mr. Papandreou’s move unleashed political chaos on Tuesday after it emerged that despite having met his German, British and French counterparts only the weekend before, he had not told them of the plan to hold a referendum in January. Even his Finance Minister, Evangelos Venizelos, was caught completely unaware. It was widely reported that Mr. Venizelos was hospitalized Tuesday with stomach pain. I’ll say. I have believed for quite some time that the question is not “if”, but “when”. As in, when will Europe go down the tubes? Greece is within weeks of running out of cash entirely, and a default would lead to a collapse of Greek banks and far worse austerity than any bailout would impose. In the meantime, the German-Italian bond spreads continue to hit all-time highs. I had lunch with a German, an Italian and a Frenchman yesterday and we got on to the topic of the economy. No one thought that Greece was going to get out of this alive, even if they take on the rescue package they want to hold a referendum on. The Italian was bewildered at why the markets were punishing Italy so much – too much in his opinion (it does have a Debt to GDP ratio of almost 120%). The Frenchman was worried at rising unemployment and that S&P was going to downgrade their credit rating any day now. The German reacted pretty much as you’d expect someone to react to throwing good money after bad. None of them regarded the political situation in their home countries as particularly rosy. It’s bleak almost everywhere and the powder keg is growing – so the question is, where do you park your money these days?